The Chicago Blackhawks have signed defenceman Brent Seabrook to an eight year contract extension worth $55 million. Seabrook is now locked in through the 2023-2024 season. He’ll be an alternate captain for the first time this season and will earn $5.8 million in the final year of the current deal. Under the extension, he’ll pick up an average annual value of $6.875 million. The contract will put more pressure on the Blackhawks when it comes to the salary cap, but general manager Stan Bowman will cross that bridge when he comes to it. Right now, getting his man inked to a long-term deal is all that matters. 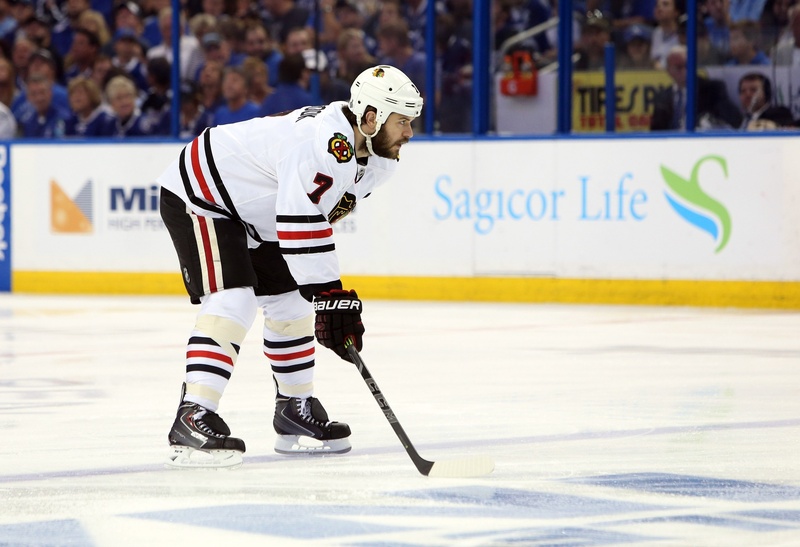 Along with Duncan Keith, Seabrook forms the cornerstone of the Blackhawks’ defence. The 30-year-old from Richmond, British Columbia, averaged 22:10 of ice time a game and bumped it up to over 26 minutes a game in the post-season. He had 31 goals in 82 regular season games and added 11 points in 23 playoff games. Naturally, the conversation has to fall to what the Blackhawks will do next. Something has to give when you consider that Seabrook, Keith, Patrick Kane, Jonathan Toews, Corey Crawford, and Marian Hossa account for a combined cap hit of $44.7 million when the extension kicks in. It’s not likely that the salary cap ceiling will change by much next season, which will give Chicago roughly $30 million with which to snag the rest of their roster. Word around the campfire is that the Blackhawks will look to trade someone significant. That seems the most likely option for the moment, which in turn puts someone like Hossa at the front of the conversation. He’s 36-years-old and could theoretically still fetch a decent return, plus he’s under contract until 2021. The Blackhawks will have some tap-dancing to do, without question, but right now the focus is on this season and putting together another Cup run. With Seabrook locked in and Bowman doing the job to nail down his key players without breaking the bank, Chicago may have yet another reason to celebrate soon enough.